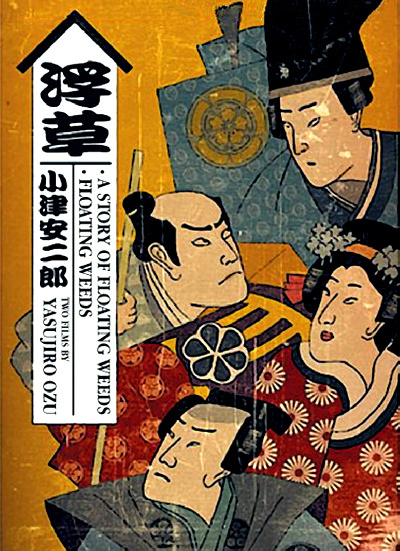 “Floating weeds, drifting down the leisurely river of our lives,” has long been a favored metaphor in Japanese prose and poetry. This plant, the ukigusa (duckweed in English), floating aimlessly, carried by stronger currents, is seen as emblematic of our own journey. And sometimes this identity is made explicit—in the lives of traveling actors, for example. It is with these that Yasujiro Ozu's 1934 A Story of Floating Weeds (Ukigusa Monogatari) and his 1959 Floating Weeds (Ukigusa) are concerned. Both films revolve around a recurring character type who appears in several other Ozu films: the lovable ne-er-do-well usually called “Kihachi” (though in the 1959 version he is called Komajuro). Here, we find Kihachi as the leader of an itinerant dramatic troupe, returning to a small town where he has a lover by whom he has a now-grown son. The boy does not know this but the leading lady of the troupe — the boss’ mistress — finds out and plans her revenge. Though both parents had hoped or some permanence, a family life, the end of both pictures finds the troupe leader again on the road. He continues to drift down the river and Ozu’s major theme — the dissolution of the family — is again demonstrated.